Hanoi (VNA) – The second national press awards on the fight against corruption and wastefulness was launched in Hanoi on March 25. The awards were organised by the Vietnam Fatherland Front (VFF) Central Committee, the Vietnam Journalists’ Association and Vietnam Television. 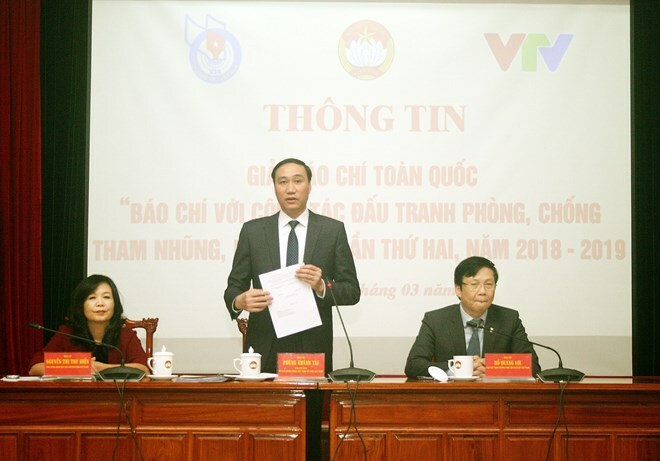 Vice Chairman of the Vietnam Journalists’ Association Ho Quang Loi said the contest is open to all types of media, from print newspaper, television, radio to e-newspaper. Entries should reflect the harms of corruption and wastefulness, as well as the VFF, people and the press’s role in fighting the issues. They should also promote good examples and role models in the work while reporting on the improvement of institutions, management, discovery and settlement of corruption and wastefulness, he added. The awards aim to bring into play the role of the VFF, socio-political organisations, people and media in the fight against corruption and wastefulness. They also look to encourage the public and press agencies to engage in these efforts.